How did we choose the name Salish Sea Players? Well, when we started talking about a name for ourselves we tried out several musical names but none of them felt right for some reason. I (Linda) had recently moved back to Seattle and started talking about how wonderful the surrounding mountains and waterways made me feel. Olga joined in and talked about her and Fred’s love of the Skagit Valley; then our mutual love of the Chuckanut Drive and all points north and south along the coast. 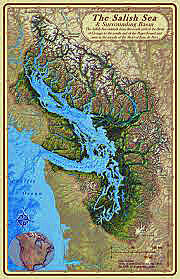 I stumbled across a map and some articles about the Salish Sea while I was doing a bit of web surfing. I immediately loved the name and how it describes the combined waterways of the NW and our collective love of the area. We have added some links to some great sites that speak about the naming of the area, the history, and the ecology. Please enjoy! !